What a great idea – so natural and so much prettier than a typical door mat. What a great idea – very pretty! 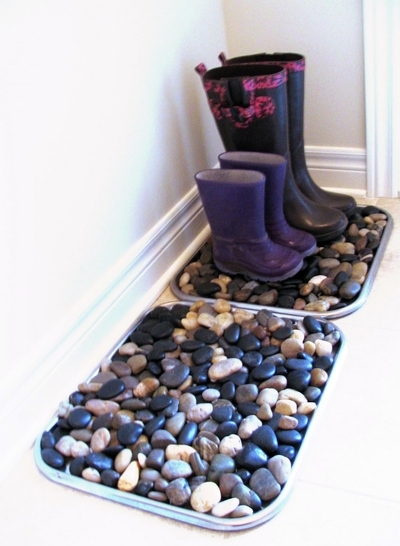 WHERE CAN I BUY THE BOOT TRAYS FOR $1.00? Try Dollar Tree or Walmart. This is so much nicer looking than my pile of shoes on a mat. I would have to glue down the rocks though, my little boys are prone to filling their pockets with them! Plus, that way I can easily take them out and hose them off. We are getting ready to move from the south, to North Dakota. I already have the mat, I just need the rocks. I’m sure my husband will be wearing home snow packed boots frequently. I wonder if you could use those mesh mats of river rocks that they sell at home improvement stores. It would be more expensive but then those of us with little boys could still do this. @Rachel, thanks for the tips!! How cute!!! Is it easy to drain the water out that it collects? @Rachel, Tip- To avoid the rust, spray paint with Rustoleum! Do you glue the rocks? How can you keep them flat? In your blog you say “dollar store” where I live i don’t think our dollar store carries things like these, what’s the name of your dollar store chain? Ours is the dollar tree, where everything in the store is a dollar. Or we have dollar general which it’s random prices. Thanks for the idea can’t wait to do this! Hi Rachael, The store I shop at is Dollar Tree too. You can get the river rocks in the floral section, and smaller cookie sheets in the baking section. I wouldn’t recommend this if you have any pets in the house. It would be much too easy for a small dog to end up playing with the pebbles and possibly even choke on them. The link for how to make it does not work. I’d like to know what you glue it with. Thanks. @karebear — you just put rocks in a tray. No glue needed. If you DO want to glue, I would use E-6000 or silicone caulk. LOVE IT!! I FIND A LOT OF CRAFT. ITEMS A DOLLER TREE! MARY. Pingback: DIY Boot Tray | i'm a transplant from california. I love this!! How do you drain the collected water though? Menards frequently has plastic boot trays for $1 or free after rebate. I’ll be glueing my rocks down with E-6000 (Wal-Mart). Found the rocks @ my Dollar Tree – by floral & candles.